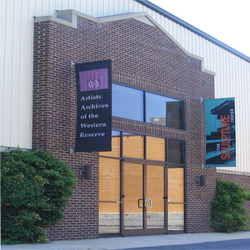 The Artists Archives of the Western Reserve was founded in 1996 by noted Cleveland sculptor David E. Davis and eight other prominent Ohio artists. The founders recognized that upon an artist’s demise, important parts of this region’s cultural heritage can be lost when art is abandoned, mishandled, or dispersed. The founding artists believed in the importance of preserving Ohio’s unique visual artistic heritage. The AAWR, its mission of preservation and its University Circle facility is the living embodiment of their commitment. The founders envisioned a “living archive” – a facility where archived artwork could be preserved, displayed, and studied by the public and scholars alike. The Archive would maintain a representative body of the artists’ work as well as documentation of their lives and careers as Ohio-based artists. Accordingly, the AAWR records oral histories, catalogs exhibition materials and collects related documents on Ohio artists. Bernice and David E. Davis’ initial contribution to the AAWR provided for the construction of a new facility to house the organization. Completed in the fall of 1999, the facility is located in University Circle, Cleveland’s premiere cultural district. The AAWR facility houses a spacious 1500 foot art gallery, offices, and 108,000 cubic feet of temperature and humidity controlled storage space. Contact AAWR for additional information or call us at 216-721-9020.